Margaret Joy Bond was born and raised in Edmonton where she worked variously as a teacher and typist. Margaret’s father, Victor P. Bond was part owner of the Bond-Adams Company Limited, a real estate investment company, originally based in Port Arthur, Ontario. The company moved its head office to Calgary prior to the First World War and also had an office in Sudbury, Ontario. The Calgary office dealt directly with the many clients and companies involved in land speculation in western Canada at the time. Many of the clients were from the mining districts of northern Ontario. Victor Bond later owned a tailor business in Edmonton, V.P. Bond and Company. The fonds consists of textual and photographic records of Margaret Bond, the Bond-Adams Company and Victor P. Bond. The records for Margaret Joy Bond include personal correspondence, postcards, a scrapbook and certificate (1948-1966). The records for the Bond-Adams Company include business correspondence and accounts books dealing with clients, companies, and land deals including the record of sale of Tofield Industrial and University Plateau, land speculation in Victoria, B.C. and documents for Walters vs Bond Adams. There are also insurance forms, pamphlets and advertisements (1910-1915). The records for Victor P. Bond consist of an accounts book relating to an unknown business of Victor P. Bond, order forms for suits and accounts journals for Victor P. Bond’s tailoring business (1920-1922,1947-1958). The photographs include images of farming, coal mining in Toefield, construction, construction, firefighting equipment and the offices of the Bond-Adams Company (ca. 1910-1912). 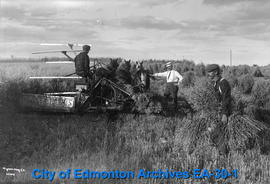 This fonds was donated to the City of Edmonton Archives by Margaret Joy Bonds in 1968. The material was arranged by the archivist based on creator. The photographs were assigned item numbers with the prefix EA-30.